Ranthambhore National Park is the one and only dry deciduous tiger habitat in the world. The Ranthambhore National Park is a small portion of the Ranthambhore tiger reserve. It is located in the Sawai Madhopur district of Rajasthan. 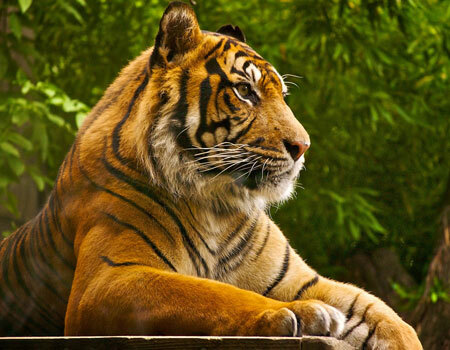 It is the only forest reserve in the state that houses the wild Bengal tiger till date. It covers a total area of 1,334 square kilometres. Tourists come here to see the rich flora and fauna. The park remains open for visitors from October to June. Tigers can be spotted in plenty at the Ranthambhore National Park. There are around 40 tigers and leopards each, still living in the wild. They can be easily seen around the confluence of lakes Padam Talab, Milak Talab and Raj Bagh Talab. Other animal residents at the park are Sloth Bear, Porcupines, Wild Boar, Leopard, Chinkara, Marsh Crocodile, Jackals, Gazzelle, Indian Hare, Jungle Cat, Sambhar, Mongoose, Nilgai and Monitor Lizards. The park is home to several resident as well as migratory birds and thus is also a bird watcher's delight. The Ranthambhore National Park has a rich variety of flora. The landscape of the park is dominated by trees like Banyan, Dhok, Mango and Pipal. Shallow lakes, plateaus and gentle slopes can be found here. Several special attractions are present within the Ranthambhore National Park including Ranthambhore Fort and Jogi Mahal. The 10th century Ranthambhore Fort stands at the centre of the park. Jogi Mahal, a rest house inside the park houses India's second-largest Banyan tree. The tourists can visit the Sawai Madhopur Village that offers a taste of rural Rajasthan. It lies in the vicinity of the national park and houses several historical monuments. Architectural wonders in Karauli and Bundi are other tourist attractions within easy travelling distance. Tourists can also visit Kota (100 kilometers) known for its City Palace, Jagmandir Palace, Kota Barrage, Kishore Sagar Tank and Brij Vilas Palace Museum. The safaris conducted inside the Ranthambhore National Park are quite exciting. It is an ideal place to come face to face with tigers in the wild. The timings to explore Ranthambhore Wildlife Sanctuary vary as per the season. The entry and exit schedules differ in summers and winters. As the daylight hours are lesser in winters, the entry is comparatively later and similarly the exit is earlier.